SIFANG brand Wheeled Tractor SF354~554 series are designed for tilling mainly in dry land and also in paddy field by taking transportation Function into consideration. They feature compact structure and convenient maintenance. They can be used for tilling, harrowing, planting, straw back-feeding to the field, harvesting and transportation with different farming implements or trailers. 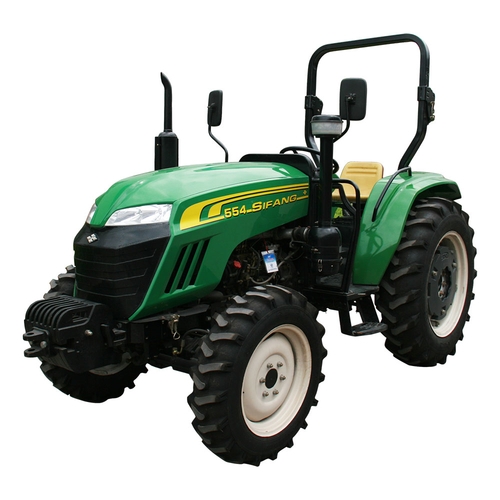 SIFANG brand wheeled tractors are advanced models. They have advantages of more powerful and economic compared with the same models. The gears can be shifted lightly and conveniently with meshed set of gear-shifting system in its gearbox. It can reach convenient working and high efficiency with its double-action clutch and semi-independent type output. The steering is very easy with its independent oiling system and complete hydraulic steering of front wheel. It can be well suitable for working in the paddy field with small axle-base, high clearance and small turning radium. It features compactness of structure and good reliability with planetary decelerating system for its final transmission. Users have enough choices on crawling gear, close driver’s cab, etc.